I can't believe that my baby is already a year old! It was a very busy year and flew by. Scarlett still isn't the best sleeper. We had hoped that once she weaned it would be better, but she still wakes up at least once a night. The only plus is that Kyle helps if she wakes up in the first half of the night. So now I at least get some nights where I don't have to wake up. 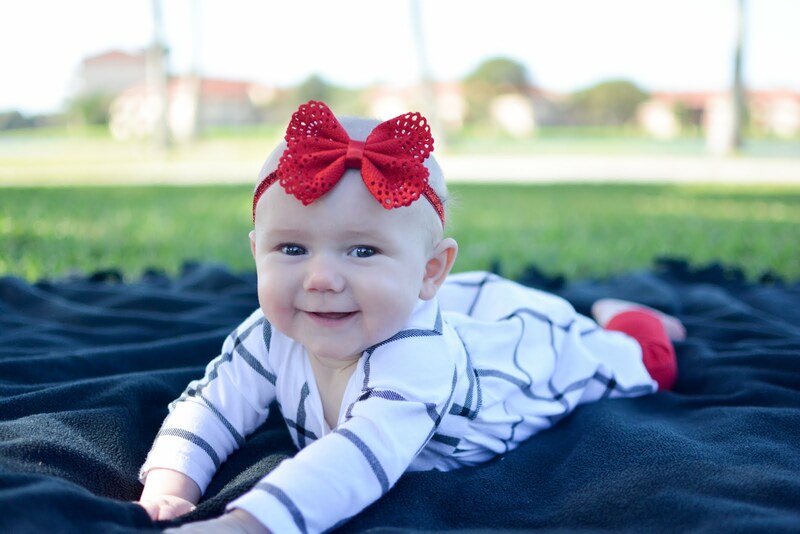 She has a wonderful personality and people are always telling us what a happy baby she is. Scarlett loves people, especially other children. She thinks her cousins are the best. Scarlett has been enjoying emptying her toy bins and re-filling them. She also enjoys emptying all the bookshelves, hers and ours. And she especially loves taking all the soda cans out of the boxes and putting them into others. Scarlett also likes her books and her dog that sings. She is great at entertaining herself and quite content to play with her toys as long as we're nearby. Scarlett loves to talk, and while a lot of it is still babbling she does have a few words. She can say "mama" and "dada". The second she hears Kyle come in the door she starts saying "dada" and crawling to him. She can also say "hi" and waves or blows kisses. Scarlett has loved music from the very beginning and loves to sing. She sings "ashes, ashes" (Ring Around the Rosie) and "up a-bu da" (Twinkle, Twinkle Little Star). I am so thankful we chose to do Baby Led Weaning with her. Lately she only wants to eat something if we eat it first. She loves pancakes, french fries, homemade popsicles, and frosted cheerios. She gets very upset when she finishes eating something she was enjoying. This has been sitting in my draft folder for 6 months...oops! Our lives seem to revolve around Scarlett's sleep. I loved the sleep suit because it got her in her crib and rarely waking. Unfortunately, that didn't last long. Scarlett started waking up more and more as the weeks went on and nothing would console her except for nursing. She also has gotten much harder to put down, taking almost an hour. Once we finally do get her down she's typically up within 30 minutes. The cycle continues all night and if Kyle goes in to sooth her she just gets more upset, so it ends up with me being up most of the night. After many sleepless nights I am exhausted, so our pediatrician told us to try the Ferber Method. Hopefully it works and my baby will be back to sleeping through the night. She continues to grow long and lean. We just moved her into 9 month pants, since they finally fit her waist! She is also mostly in 9 month onesies although they are a bit long. 6 month onesies have started getting tight. She seems to have finally grown out of the tummy issues and rarely needs gripe water now, which I am thankful for. She is a ton of fun and is doing something new all the time. She rolls everywhere and is beginning to sit up. She has also started this new thing where she bobs her head side to side. She grabs everything and wants it in her mouth. She's a big fan of paper and drinks. She babbles dada all day and mama when she wants something, typically to be picked up. The other day she looked right at Kyle and said dada so clearly that we both looked at her. Her eyes are changing and have lost the blue. They are mostly gray now. I can't wait to see what color her eyes and hair will be. She began solids the last few days and is fiercely independent. She does not want you to feed her, she wants to put it in her own mouth. It makes me glad that we decided to do baby led weaning with her. She had potatoes and carrots for her first official meal. I was amazed at how she picked it up and put it right in her mouth and started gumming. She has also had pureed apples and puffs. She puts the food in her mouth, makes a face, but continues to eat it. I don't think she's a fan of the texture yet. Hopefully we'll have a good eater. This month we celebrated both Halloween and Thanksgiving. Holidays are so much fun to share with her. Scarlett was sleeping in her Rock N Play because she was waking up and couldn't be consoled in her crib. However, one night she tried to roll out of the Rock N Play and got her top half over the side. It scared me so bad that we knew we had to get her to stay in the crib. She hated it and after a week of horrible nights I finally broke down and bought the Magic Merlin Baby Sleep Suit. She may look like the Michelin Man, but she sleeps the whole night in her crib, only waking up once to eat. She's still in 6 month clothes, officially the longest she's been in a size. We always have problems since she's so long and skinny. Her pants are too short already but her waist is too small for the next size up. This month Scarlett has learned lots of new tricks like sticking out her tongue and eating her toes. She is also able to roll from back to front and front to back. She'll roll over and over until she gets off her mat, then she cries because she can't play with her toys. She still wants lots of attention and gets upset if she can't see you while she's playing. She's also hit the "stranger danger" stage and doesn't like when she's not with me or at daycare. She gets a huge pout on her face and starts crying if I don't get her. It makes it hard for family who has come down to visit this month. Overall she's a very happy baby and we love seeing her personality grow. I've been back at work for 6 weeks now, which means Scarlett has been in daycare full time. It has helped a lot to get her onto a schedule, but now if she's off her schedule she gets super cranky. Scarlett goes down between 6:30 and 7:30 every night. She was sleeping until 5:30 or 6, when I woke her up for daycare. Unfortunately, she's hit the 4 month sleep regression and wakes up at least once or twice during the night. We tried transitioning her to the crib, but she was waking up a ton and couldn't be consoled. Her pediatrician said to just let her stay in her Rock N Play for now. She's still in 6 months clothes and despite eating a ton, she's very skinny. between 6 and 8 oz each. I couldn't keep up pumping and was stressing myself out to the point that I was pumping even less. Now I can get her three 6oz bottles and if she's still hungry they give her formula. She could care less what she's eating or how she's getting it as long as food's getting in her mouth. Scarlett has gotten very curious and wants to explore everything. She loves all her toys, but doesn't want to be left alone. So she spends time in her bouncy chair, swing, high chair, and play mat to be near us. She has also started rolling. It was very sporadic at first, but yesterday she finally figured it out and rolls every time she's put on her belly. She thinks so many things are funny and we love to make her laugh. We're so looking forward to the holiday season with our little one and can't believe how quickly she changes. This month we finally figured out that a lot of her tummy problems stemmed from constipation. Her doctor prescribed her 2oz of prune juice a day and she's a different person! Scarlett's also gotten herself onto a basic schedule now. She starts to go down between 7:30 and 8:30 and will sleep 9-10 hours. Then she eats and goes back down until 7:30 or 8. She typically eats at 8, 11, and 2. The afternoon doesn't really have a schedule. She spent a day with Grandma Ria, a day with Daddy, and a day with Nana as I had to go back into work for a few days before school actually started. She did great and has no problem switching between a bottle and breastfeeding. Of course that means I've gotten to start pumping at work, which I don't love. She is growing like crazy and switched into size 2 diapers at 10 weeks thanks to all the diaper explosions! 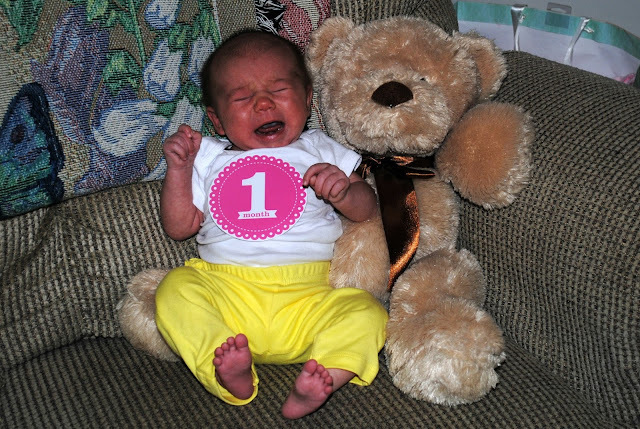 She started wearing 6 month clothes a few days before she hit 3 months. so I was glad when she finally was able to fit the next size! She's also started to teeth and wants everything in her mouth. Her favorites include, her blanket, fists, and our fingers. She started daycare when I went back to work on the 17th. and is always smiling at the workers when I drop her off and pick her up. They can't get her to sleep in a crib there either so right now she's still sleeping in her Rock N Play. Hopefully we can get her to transition soon. 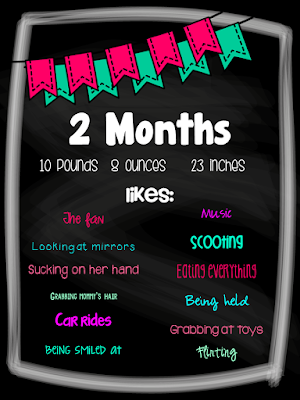 Well, Scarlett turned 2 months 3 weeks ago and I keep forgetting to post this, but better late than never! She has definitely been calming down a lot more as she's gotten older. She is still in size 1 diapers and 3 month clothes. Carters brand fit her long skinny body best. She smiles and giggles all the time now. She absolutely loves to look at herself in mirrored toys and will spend lots of time smiling and giggling at herself. She has started grabbing at toys if they are near her. Scarlett is still an amazing eater and eats every 2-3 hours during the day. At night she typically sleeps about 6 hours before waking up to eat, then goes back to sleep until 7:30 when Kyle gets her up before leaving for work. We're currently bathing her in the kitchen sink and she likes to kick and splash, making it a two person job! I know have to watch her whenever I put her down! She'll scoot herself into a different position. It scared me so bad when she turned herself in a 90 degree angle on the couch the other day! We moved into our brand new home this past weekend (July 25). Scarlett now has her own room. We got a rock n play for her, and have been putting her to sleep in that since it's not as propped as her bouncer. Last night she fell asleep in it in her room pretty early and didn't want to wake up. So she officially slept in her own room for the first time! Mommy was not ready! I was planning on keeping her with us for at least a week. I thought new house, new room, and new thing to sleep in would be way too many changes. We'll have to see how it continues to go. We are loving our precious little girl and continue to love seeing her grow and change by the day. I can't believe how quickly a month has gone! I feel like I just had my baby and yet I've already had to pack away her newborn clothes. Scarlett already seems to have so much of a personality. She definitely lets you know what she wants. And by lets you know I mean screams until you figure it out. She's been great at eating from the beginning and continues to do so. She eats typically every 2-3 hours, but some nights has given us 4-5 hour stretches. 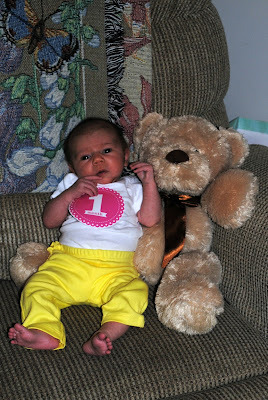 From day 1 she was able to hold her head up for brief periods of time. She likes to lay on her her tummy on our stomach and hold her head up to look at us. She has started smiling sometimes when Kyle comes home from work and she hears daddy's voice. We spend a lot of time walking outside with her in her Moby wrap or carrier. She loves being super warm and if she's screaming and we take her outside she'll stop. She doesn't like baths unless her whole body is under the water. Having to get out and have lotion put on is the worst. She is not happy with laying on her back and instead sleeps in her bouncer. If she could she'd sleep on one of us constantly. I can't get enough of her and can't wait to see the changes each day brings. 200x200Other size options are available, just ask!